The other day I was going through the dollar records at Rock ‘N Roll Land, a fine indie record store in our corner of Wisconsin. I pulled out a couple of Cowsills records, then couldn’t remember which ones my friend Larry recommended on his Iron Leg blog. Not far from the Cowsills, there was this. Wondering what the Buoys sounded like once you got past “Timothy,” I took a flyer on it. Every so often, record diggers do that. In what likely was 1969, a Scepter Records executive was tipped to the Buoys. He heard them playing in a pizza place in Exeter, Pennsylvania, and sent them to New York to work with session man Rupert Holmes, who’d worked with the Cuff Links. The Buoys, who’d started gigging around Wilkes-Barre and Scranton as teenagers in the mid-’60s, released “Timothy” regionally in early 1970. It did nothing. A year later, it got a national release, and all that attention. Fast forward to today, when Rupert Holmes is known more as a successful composer and playwright than the guy who wrote that long-ago song on the radio. He wrote “Drood,” a murder mystery/musical that won all kinds of Broadway awards in 1985. It’s become so popular that even high schools do it now, opium den and all. Our son Evan had one of the lead roles during his senior year at Green Bay East. 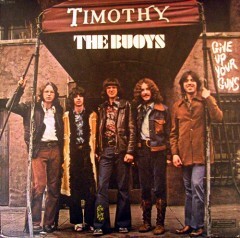 Listening to the Buoys beyond “Timothy” for the first time, Holmes’ five songs clearly foreshadow the stage music to come. He arranged the entire LP, save for “Timothy,” but it isn’t clear whether he sings or plays on the record. Some sources credit Holmes as playing piano on the record, but not its liner notes. This is a remarkably sophisticated record, and not all because of Holmes. The five Buoys — Bill Kelly (lead guitar and flute), Gerry Hludzik (bass), Fran Brozena (guitar and keyboards), Carl Siracuse (guitar, keyboard and flute) and Chris Hanlon (drums and percussion) — wrote five songs, too. They’re tight, finding just the right grooves for a diverse bunch of songs inspired by the pop, prog and folk of the day. “Memories,” written by the band, with dual flutes! Both by the Buoys, from “Dinner Music,” 1971. It’s out of print. Great stuff. I remember arguing with friends about Timothy. Some said Timothy was a a donkey. Either way it was a great tune. Rupert Holmes is also famous for Escape (the Piña Colada Song) but you likely know that. Been following your Blog for awhile (1 yr.+, connected thru Funky16Corners), & the “Timothy” song always brings back fun memories, as kids just “discovering” radio (1050 CHUM-AM in Toronto) when that song was being played. Name of younger brother and EVERY time it played we’d yell at him to come listen to “his song”! LUV the song too & NEVER knew it had “dark” overtones until much later. PLEASE come by & visit. Membership is FREE, but have to become a member to participate (make up a non-personal account). Motto: “Keep sharing the good music!” You too.